^ "Dutch cannabis cafe owners fight changes - BBC News". BBC News. 27 April 2012. Retrieved 16 August 2016. ^ "Inside San Diego's First Legal, Medical Pot Shop". NBC San Diego. Retrieved 29 July 2016. ^ "Amsterdam Coffeeshops Guide". amsterdam.info. Retrieved 2017-11-11. 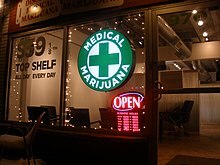 ^ "List of Canadian dispensaries". List of Canadian dispensaries. Archived from the original on 2012-06-11. ^ "Marijuana History". Narconon International. ^ "Bientôt des "cannabistrots" ?". Libération.fr. This page was last edited on 16 November 2018, at 01:39 (UTC).